Dalton Banks of Eau Claire North fires off a pass against River Falls on Jan. 26 at North. Osseo-Fairchild’s Logan Mulhern works inside the McDonell Central defense Dec. 20, 2018 at Osseo. “He’s a guy who puts his team first and he’s a guy who is willing to do anything it takes to win. He’s not all about scoring,” Nicolet coach Allan Hanson said. 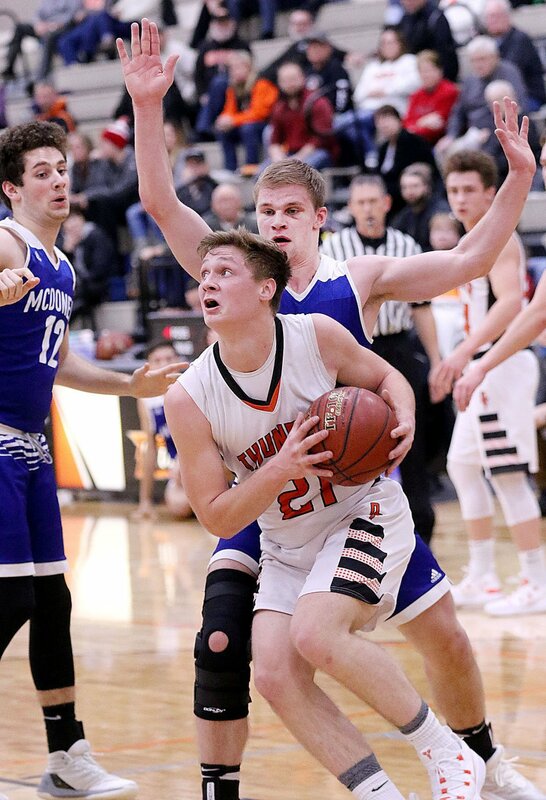 Locally, Osseo-Fairchild’s Logan Mulhern and Eau Claire North’s Dalton Banks were named to the AP’s All-State third team. Receiving honorable mentions were Eau Claire Memorial’s Caden Boser, McDonell’s Cory Hoglund and Colfax’s George Scharlau. The Cardinals won six consecutive games leading up to the state title game. “It’s been quite a journey for these guys and myself, so it’s been a really outstanding year,” Boos said. Others nominated for coach of the year were New Glarus coach Travis Sysko, who led the Glarner Knights to their first WIAA Division 4 title; Paul Wollersheim, who directed Greendale Martin Luther to the Division 3 title; and Brookfield Central’s Dan Wandrey, who led the Lancers to their first state championship. Patrick Baldwin Jr., soph., Sussex Hamilton; Johnny Davis , jr., La Crosse Central; Marcus Domask, sr., Waupun; Mike Foster Jr., so., Milwaukee Washington; Jalen Johnson , jr., Glendale Nicolet. Trequan Carrington, sr., Greendale Martin Luther; Marquise Milton, sr., Racine Horlick; Jacob Ognacevic, jr., Sheboygan Lutheran; Jamari Sibley, jr., Glendale Nicolet; David Skogman, sr., Waukesha West. Dalton Banks, jr., Eau Claire North; Jaden Kreklow, sr., New Glarus; Logan Mulhern, sr., Osseo-Fairchild; Cole Nau, sr., Brookfield Central; AJ Vukovich, jr., East Troy. Chombi Lambert, sr., Manitowoc Roncalli; Deontay Long, sr., Milwaukee Washington; Caden Nelson, sr., Monona Grove; Levi Nienhaus-Borchert, sr., Kimberly; Anthony Washington, jr., Madison East. Alex Antetokounmpo, jr., Whitefish Bay Dominican; Carson Arenz, jr, Onalaska; Bailey Blanchard, sr., Clear Lake; Caden Boser, jr., Eau Claire Memorial; Larry Canady, sr., Racine Park; Trevon Chislom, sr., McFarland; Cade Christensen, sr., Fond du Lac St. Mary’s Springs; Kevin Cook, sr., Milwaukee Bay View; Nobal Days, sr, Racine Park; Ace Evans, sr., Greendale Martin Luther; Jacob Fierst, sr., West Allis Central; Donneil Gray, sr., Madison La Follette; Bryce Fuerlinger, sr., Columbus Catholic; Carter Gilmore, jr., Arrowhead; Carter Hanke, sr., Marathon; Mayson Hazaert, sr., Wrightstown; Cory Hoglund, sr., Chippewa Falls McDonell; Tyrese Hunter, soph., Racine St. Catherine’s; Donovan Ivory, sr., Kaukauna; Xzavier Jones, sr, Greendale Martin Luther; Max Klesmit, jr., Neenah; Jason Larson, sr., G, Mount Horeb; Reid Larson, sr., Fennimore; Isaac Lindsey, jr., Mineral Point; Will Mahoney, sr., Appleton West; Grant Manke, jr, Bangor; Samuel Meerstein, sr., Green Bay N.E.W Lutheran; Jack Monis, sr., Lakeside Lutheran; Parker Nielsen, jr., Prescott; Henry Noone, sr., Oshkosh Lourdes; Nick Otto, sr., Appleton Xavier; Noah Parcher, sr, La Crosse Central; Will Pytleski, sr., Green Bay Southwest; Malcolm Reed, sr., Barneveld; Troy Reeves, sr., Madison La Follette; Preston Ruedinger, soph., Oshkosh Lourdes; George Scharlau, sr., Colfax; Quinn Steckbauer, sr., Merrill; Tyrell Stuttley, jr, Onalaska; Kaleim Taylor, jr., Milwaukee Academy of Science; Karter Thomas, jr., Oshkosh West; Damontae Thompson, sr., Madison East; Casey Verhagen, fr., Sheboygan Lutheran; Austin Westra, sr., DeForest; Jaeden Zackery, sr., Westosha Central. Player of the year: Jalen Johnson, jr., Glendale Nicolet. Coach of the Year: Jeff Boos, Sun Prairie.